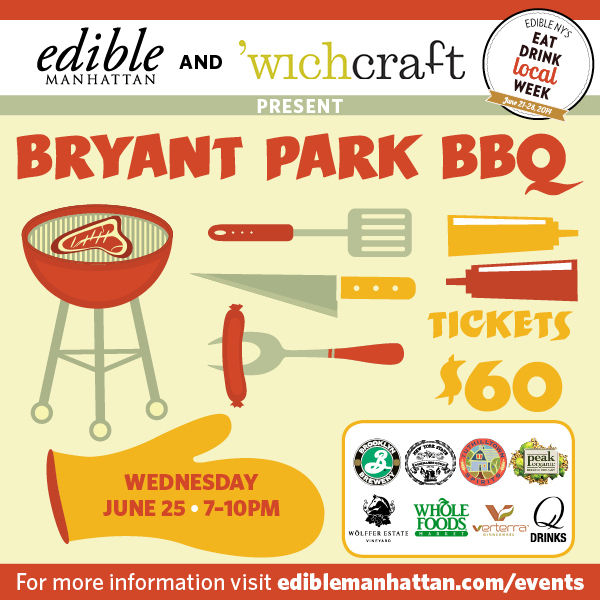 Edible Manhattan and ‘wichcraft are teaming up to bring you a quintessential summer BBQ in Bryant Park on Wednesday, June 24th from 7 to 10pm. On the food menu, there’s kale salad, pork ribs, BBQ chicken, baked beans, green salad, salt potatoes and mini cupcales from ‘Wichcraft. Plus cocktails and refreshments from Tuthilltown Spirits, Duduklu, Jack From Brooklyn, Brooklyn Republic Vodka, Dutch’s Spirits, QDrinks, Wölffer Estate Vineyard, Brooklyn Brewery, Whole Foods Market, WTRMLN WTR and Cup & Compass.